Discussion in 'Pokémon Sword & Shield Discussion' started by Black.Rose, Feb 27, 2019. I like Grookey. Aren’t monkeys rare in UK? I find it interesting they went with another monkey. Maybe it will evolve into a rare monkey species?.. I just hope it’s not a Gorilla. There are no native monkey species in the British Isles at all, only those you find in zoos, wild life parks or kept as pets and probably occasionally some escaped pets here and there, but I don't think that really has any relevance. I think they could do a good design of a gorilla if they focus on the highly developed social skills, empathy and intelligence of, for example, mountain gorillas. I'd love to see a "gentle giant" type who allows small bird Pokemon to nest on his back and stuff like that. Fun fact, while if this happened it wouldn't be the first /Fairy to have flowers in its design, it would be the first Grass/Fairy to have flowers in it's design. But Oranguru is an orangutan (you can tell by the head shape and face). 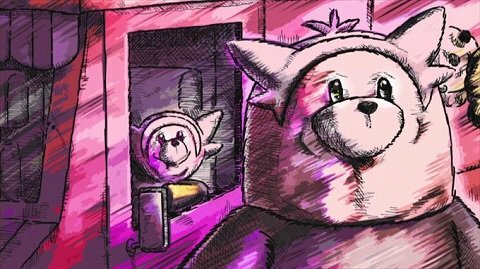 PokeMon2.0 and TheWanderingMist like this. The gentle giant part sounds cool, but I feel the nesting bird Pokemon thing puts it at risk of making it too similar to Torterra. Gibbon? Golden lion tamarin? The baboon that's famous for bathing in hot springs? Hopefully the color scheme focuses on green so it looks plenty distinct from Passimian. Maybe its tail could be made of vines? I'd love to see it end up as like a 7 foot tall mountain of a gorrila that (while not in it's model, or maybe not in it's official art work) is show to have like regional birds on it's back. Given previous patterns, I'm guessing that the middle stages of Hibanny, Messon, and Sarunori will look awkward as most middle stages usually are. I hope Sarunori's last stage isn't a gorilla, though. Other then totodile's evolution gen 2's middle stages aren't awkward. 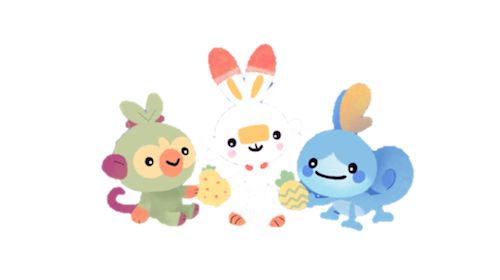 Also it's Grookey, Scorbunny and Sobble. Using the Japanese names in English is annoying. SoulRebel726, Alli, PokeMon2.0 and 1 other person like this. I like most middle stages.....in a few cases more than last. Regarding middle stages, I just hope GF changes their ways and reveal them around August instead of just one month before the game (their usual way). The middle stages are never as strong as the first (cute babies) or the last (fully formed warriors), so it would help a lot if GF gave us more time to grow attached to them instead of giving us just 3 weeks before they are inevitably eclipsed by the last stages. Agreed. I don't speak Japanese, that's why I'm on an English forum. Having to google names to understand what you're talking about is a good way for me to just ignore you going forward. Just use English names when speaking in English please. I promise that it doesn't make you sound any smarter or more cultural, just pretentious. Missingno.Fan, DSDark and Orphalesion like this. Considering the fact that @Leonhart ’sprofile says he’s from Japan, doesn’t it seem to be a bit inconsiderate to just tell him to use the English words when he’s more familiar with the Japanese? He’s not doing it to sound smart nor cultural, but because he’s used to using those words. I understand if you want him to try and use English when using a predominately English fourm but just being rude by saying “it’s Grookey, Scorbunny and Sobble” and “it doesn’t make you sound any smarter” just sounds ignorant. There’s a better way to ask him to try and use English terminology without being rude. WishIhadaManafi5 and Leonhart like this. Fair enough, I just see it often enough that I assume that at least some people are just trying to sound smart. My apologies if that isn't the case here, but it certainly is in other instances. I would like this as well regarding the Galar Starters' whole evolutionary families in general since I like forming my teams months in advance. So the sooner we see what the 3 Starters will evolve into, the better. I live in Japan, and I'm simply accustomed to using the Japanese names for Pokemon. Besides, the context clues in my post should've made it clear that I was referring to the Galar Starters, specifically the Grass-type at the end of my post when I mentioned not wanting to see a gorilla-like evolution. Not sure why we're making mountains out of molehills. FullmetalJackie, WishIhadaManafi5, janejane6178 and 1 other person like this. I would like this as well regarding the Galar Starters' whole evolutionary families in general since I like forming my teams months in advanced. So the sooner we see what the 3 Starters will evolve into, the better. Sorry, but it's something I see all the time, not just from your one comment. It bothers me and I guess I'm not in the best of moods today so I chose that comment to jump on. But seriously, I see it all the time in many places, from people that I know aren't Japanese/live in Japan. So again, I apologize to you, but I don't believe requesting English names in an English form is making a mountain out of anything. I simply prefer to not having to search for things when the poster could have just used the language native to the forum that he/she was already speaking in. And that's enough on that subject. Moving on. It is really ironic when you think about it. They talk about all the advertising the starters get, because that is your first Pokemon. And then there is the final stages which you will likely see the most. And then middle stages are regarded as these things that barely matter as they are just the bridge between the other two. But you really do spend alot of time with them. Lvl count alone You usually spend more time with your middle stage than the base (specially considering unless it's from an egg said Stater is already lvl 5, meaning roughly a third of it's way to evolving is done. I can remember, one of the reasons I chose Bulbasaur was that it spends less time as Ivysaur than Charmander and Squirtle spend as their middle evolutions. The middle evolutions of starters often do seem to fall into a sort of scruffy or unsure "awkward stage" almost as if your starter has become a young teenager not yet sure what to do with their life. Especially obvious with Brionne, imho, who has become an aspiring performer, but doesn't have the skill and elegance of Primarina yet. It does have it's charm. I live in Japan, and I'm simply accustomed to using the Japanese names for Pokemon. But you are on an English forum. I grew up in Germany and played Pokemon Blue and Yellow in German, and you don't see me calling Bulbasaur "Bisasam" because of that. And if every user who doesn't live in an English speaking country and/or isn't an English native speaker just used the Pokemon names of their language it would get really confusing. And then middle stages are regarded as these things that barely matter as they are just the bridge between the other two. But you really do spend alot of time with them. To be fair, most players only spend a few days (sometimes just a few hours) with the middle stages, whereas they spend more time training the final stages. I just hope Sarunori (Grookey) becomes a baboon or bonobo in its second stage. Something sleek and quick. But as I pointed out, the context clues were more than enough to get the gist of who I was referring to; there are only 3 Gen VIII Pokemon known at the moment (5 if Meltan's line is counted? ), and this is the Galar Starter thread, so what else would Hibanny, Messon, and Sarunori be other than "Scorbunny", "Sobble", and "Grookey"? In fairness, I'll definitely use the English names in parentheses from now on in this subforum to avoid backlash, but the exaggerated confusion over three names (that take a few seconds to Google if need be) is puzzling. 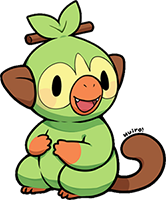 Very apropos for a grass type monkey to become this uncanny humanoid creature who has power over plants, and given its first form's mischievous nature, I can imagine it hiding among the foliage watching people in secret.